Are you an expert dog namer? This is your chance to shine! 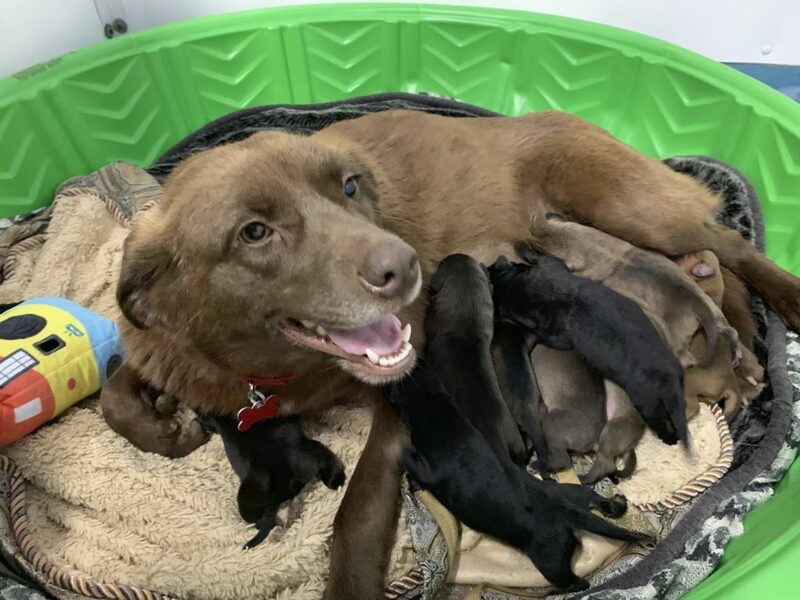 On Sunday 4/16/2019, our beautiful Chesapeake Bay Retriever, Lollipop, gave birth to nine (YES, NINE!) beautiful puppies! Lollipop’s litter will be with us for the next 8 weeks, and they’ll need lots of care and supplies to grow up healthy. That’s where you come in! The first nine generous donors to give $100 on behalf of Lollipop’s pups will receive the right to name a puppy! (Certain name restrictions apply.) You can help our newborn puppies and make a lasting impact on their lives at the same time! If you’ve always dreamed of putting your creative name talents to the test, this is your chance! Previous Post Win Two Tickets to Mumford & Sons Sold Out Show in Chicago! Next Post Win Two Tickets to Van Morrison’s Sold-Out Chicago Show!